Laurier is committed to your safety. With so many students living together in the residence, apartments and houses, everyone plays an important role in fire safety and prevention. That's why Safety, Health, Environment and Risk Management (SHERM), together with the municipal fire departments and key university stakeholders, is offering training and education to students on fire/life safety. Provides dons with basic fire safety knowledge. Dons will learn about fire safety plans, fire alarm procedures, their roles and responsibilities, prevention of fire hazards, and fire/life safety systems. Dons will also complete hands-on fire extinguisher training. This session is mandatory for all dons. Brantford campus: Tuesday, Sept. 6, 2016, 9-11:30 a.m. Provides participants with knowledge of kitchen fire safety and electrical safety. It reviews Laurier’s fire alarm procedures and teaches participants what to do if there is a fire in the kitchen. The session is open to students in the LEAF program, international students, and to students interested in learning more about kitchen fire safety. Brantford campus: Sunday, Sept. 4, 2016, 3-3:30 p.m.
Brantford campus (LEAF): Tuesday, Sept. 6, 2016, 10:45 - 11:15 a.m.
Information booths will be set up at the fairs to speak to students and answer questions about fire safety. Additionally, the Waterloo campus fair will feature grease fire demonstrations throughout the day. Waterloo campus: Thursday, Sept. 8, 2016, 10 a.m. - 3 p.m.
Brantford campus: Friday, Sept. 9, 2016, 10 a.m. - 4 p.m. 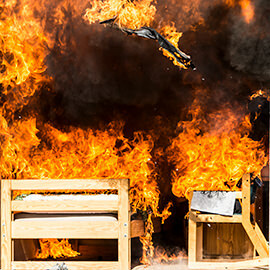 This dramatic live fire demonstration displays how quickly a fire can destroy a room, the importance of having an evacuation plan, the need to follow fire alarm procedures, and the effectiveness and importance of having working smoke alarms. A mock room will be built and furnished using typical residential materials and will be set on fire by Waterloo Fire Rescue. All first-year students at the Waterloo campus are required to attend this event. Community members are welcome to attend. Tuesday, Sept. 6, 2016, 5-6 p.m.
Students living in residence will learn about kitchen fire safety, fire alarm procedures, electrical safety, the prevention of fire hazards, and the prevention of nuisance fire alarms. All first-year students are required to attend. For additional information on any of the events above, please contact Philip Teskey, Emergency Management and Fire Safety Officer, at pteskey@wlu.ca. 1 Office of the Fire Marshall and Emergency Management, n.d.